The holidays are all about good cheer, gratitude, family, friends, and delicious food. But the season can also conjure up feelings of guilt and dread—tempting food overcomes our better judgement, leaving us full of regret. Every year festive recipes flood the internet, and come January, they are replaced with articles about weight loss and getting back on track after an indulgent month of overly rich food and too many desserts. But partaking in holiday festivities shouldn’t mean getting off track. The good eating habits you’ve been developing—being mindful and making the better choice—allow you to embrace the holidays, food and all, and enjoy the season even more. The key to success is practicing moderation, which is why Challenge check-ins include free passes. 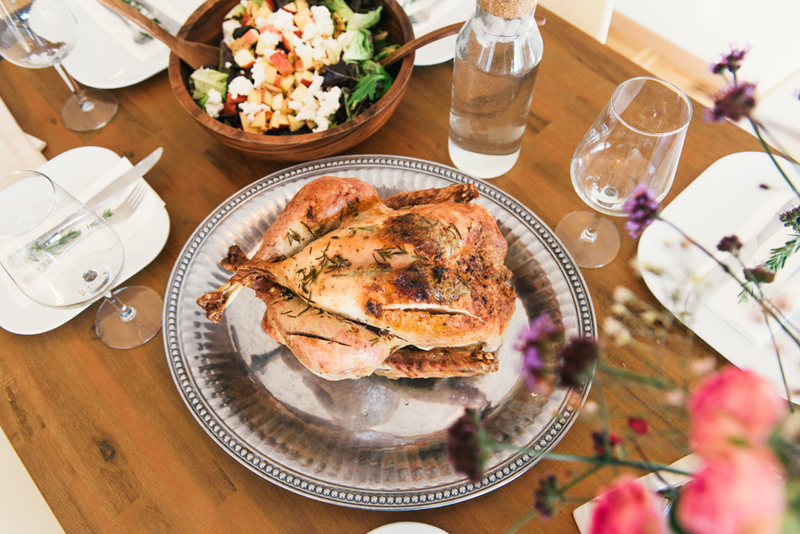 You shouldn’t have to forgo a slice of pumpkin pie at Thanksgiving dinner to be a good eater. Have one serving of pie, use your free pass, and enjoy it even more—knowing that you’re continuing to develop good eating habits and eating pie, at the same time! Don’t starve yourself on Thanksgiving morning because you know you’re going to eat a lot at dinner. Eat a well-balanced meal with protein and fiber to fill you up and give you energy. If you’re famished come dinner time, you’re more likely to over-indulge and make poor choices when filling your plate. Plan ahead. If you know you’re going to have meat for dinner, then don’t eat meat for lunch. If you know you’re going to have a piece of pie with whipped cream for dessert, don’t have a pastry for breakfast. Plan your Thanksgiving day meals in order to enjoy your free passes at dinner and still stay on track. Fill most of your plate with vegetables. One awesome thing about Thanksgiving dinner is all of the delicious vegetable side dishes. Sautéed green beans, crispy brussels sprouts, stuffed winter squash, and caramelized carrots should make it easy to cover most of your plate with veggies. Then fill the rest with turkey, gravy and stuffing. Don’t take too much. Just because it’s Thanksgiving doesn’t mean you should have to unbutton your pants to feel comfortable after dinner. Overeating likely means regret and guilt, neither of which are any fun. Plus, you need to save some room for pie, right?! Eat one bite at a time. If you eat too quickly, you won’t fully enjoy your Thanksgiving meal, and will likely overeat. The good news is that eating one bite at a time is much easier with your family and friends! Yes, Thanksgiving dinner is about food, but it’s also about people sitting around the table, and having good conversation with those we care about. Share how the good eating habits you’ve been developing allow you to stay on track, and keep you and the planet healthy. Invite your friends and family to join a Mindful Eating Challenge with you—Eat At Least 1 Distraction-Free Meal, Eat One Bite At A Time, No Food Waste or Stop Eating 2 Hours Before Bed. Let’s help each other maintain our mindful eating habits this holiday season!